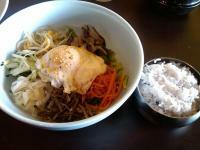 I found new Korean restaurant near my office, then we had bibimbap for Sunday lunch. I think most people don’t order only bibimbap, but it was enough for us for our lunch. My son also enjoyed tasty pajeon. We are likely to have lunch and dinner at this Korean restaurant because it tastes good! !